One of those nights last night. Woke at 3.35 am and couldn’t get back to sleep so I switched the light on and then read for an hour. Fell asleep for 30 minutes and woke again and read until 6.30, got up made tea, went back to bed then fell into a deep sleep and was nearly late for tennis this morning….and what a game it was . It was very windy so it was hard to play and the gusty wind made it very interesting, especially wearing so many layers of clothing, it was hard to move one’s arms properly, but play we did and had a great time. 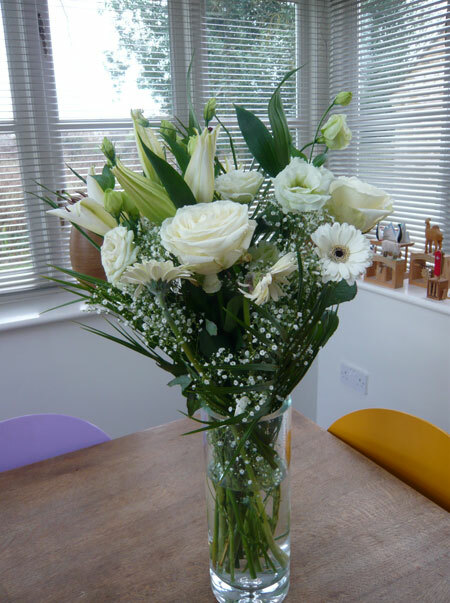 When I got back, my flowers from the Go!Smell the Flowers competition had arrived and they are beautiful as you can see – and I have still got another 11 deliveries to send where I want over the next year! What a great prize. Thanks so much, Jim and Em! Kim also posted a great cartoon from Dave Walker @ Weblog cartoons (who also drew the ‘procrastination cartoon’ I posted a couple of days ago) about organising your desk. It’s very good and I thought I would follow Kim’s lead and post a photograph of my desk so you can see where I am writing this. So I dare you, post a photograph of your desk and computer desktop. Does it say much about you? Cool workplace. Thanks for inviting us in. As for spaghetti junction, I’ve got you beat. I hope my desk says nothing about me because if it did it would probably tell you horrible lies, such as I’m a horribly disorganized and messy person. You desk looks lovely however. 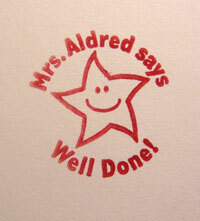 My daughter would love that stamp. Very cute. the flowers are stunning Diane !!! 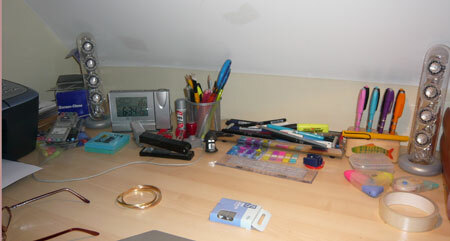 and your desk is so neat !!!! I feel guilty posting my desk after seeing yours…. and an A3 printer….now I am green !!! Jane – I’m in! Where’s the kitchen? I could do with a cup of tea…. Great idea and thanks for inviting me! Kim – they are aren’t they? Your desk was fab – a true artist’s desk! Your wish is my command, my lady. I’m rather the opposite when it comes to desks.. plus I change the ‘display’ all the time. Routine and Bridget are no buddies ha! The joke is, the rest of the room is a shambles…I didn’t show you a photograph of that! A girl’s got to have some secrets! Alligators. I also got a flat screen last week (finally), so there’s a little more space. Florida – alligators – of course! Flat screen? Cool! 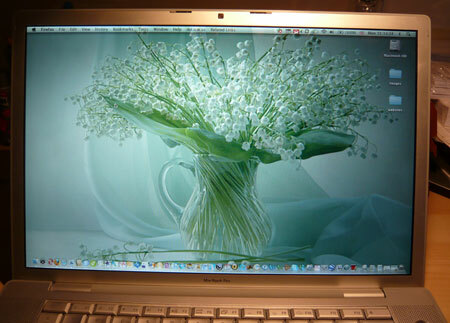 My desktop Mac still has a HUGE 19″ display and covers half my other desk….the one I didn’t show you!